Today we are talking about two things that at first seem unrelated -- changing your mind, and shoes. In the summertime, many people around the world wear a kind of casual shoe known as “flip-flops.” They are completely open. So, they keep feet cool in warm weather. They are also good to wear in the shower, at the beach or by a swimming pool – anywhere wet. Word and shoe experts both agree that flip-flops come from Japan. An article in the New York Times explains that after the Second World War ended, Japan increased its production of rubber. Among other things, workers used rubber to make a version of a traditional Japanese sandal, called the zori. Japan exported these rubber zoris all over the world. But the public did not keep the name zori. The rubber sandals became known as flip-flops. Can you hear why? “Flip-flop” is the sound the shoes make when you walk in them. So, that’s some information about the flip-flop we wear on our feet. But another way we use the word 'flip-flop' in American English has nothing to do with shoes. When you flip-flop, you completely change your mind on an issue. Not only do you adjust your thinking, but you adopt the exact opposite position. For example, maybe one day you announce to your roommates that you have become a vegetarian. You plan to eat only vegetables, beans, rice and pasta. But at the end of the week, you make another announcement. You say you've changed your mind. And now, you will only eat meat. Word historians say this usage of 'flip-flop' began around 1930 and comes from the world of electronics. “Flip-flop” referred to switching circuits that alternate between two states. Today, we most commonly use the term “flip-flop” in politics. Being accused of flip-flopping is usually not good. Let’s say you are running for a political office. Early in your political career perhaps you supported a popular issue – such as tax breaks for businesses. But now supporting that issue is not popular. So, during the campaign, you tell voters that you’ve changed your mind. You are now against tax breaks for businesses. Your opponent could accuse you of being weak, of not knowing what you believe in, or of changing your position to get more votes. A candidate who flip-flops for political gain usually gives a bad impression. Voters come to know you as a flip-flopper. If you turn 180 degrees around a circle, you will be facing in the opposite direction. So, you can use this term simply to mean turn around. For example, you could say that when your friend saw her ex-boyfriend coming toward her at a party, she did a 180 and quickly walked away. That is the literal meaning. Figuratively, doing a 180 means you completely change your opinion, or you make a big change in your lifestyle. At work, you may not want to say that your boss flip-flopped on an important issue. Saying she did a 180 is more polite. You could also say that she reversed her earlier opinion. Better still, you can say her opinion evolved. Using the word “evolved” gives the impression that she changed her opinion over a long period of time and after thinking about it very carefully. In other words, if you do not want to offend someone, you might want to save your flip-flops for the beach. And that’s the end of this Words and Their Stories. I’m Anna Matteo. Say, 'Hey baby, the winter is over. 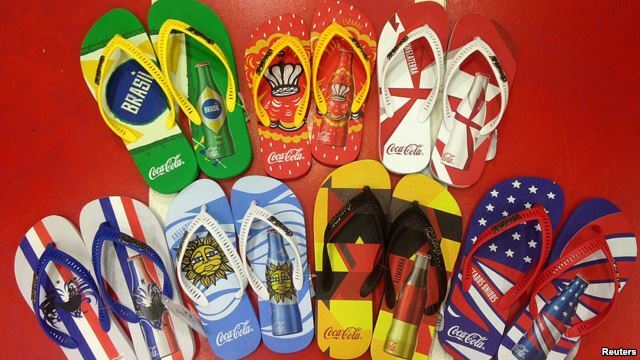 Do you use flip-flop the same way in your language? I mean, changing your mind not the shoes. Let us know in the Comments Section! switch – v. to shift to another electrical circuit by means of a switch : to make a change from one thing to another by turning or pushing a button or moving a switch, lever, etc.